The kingdom of Bohemia obsessed contemp-oraries across Europe in the fifteenth century. 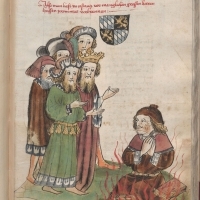 Beginning in 1415, when an international council burnt the Czech theologian Jan Hus, his followers within Bohemia seized control of the kingdom and freed it from allegiance to king and pope, threatening the ruling elites of Christendom and destabilising political and religious structures across the continent. These developments plunged swathes of Central Europe into brutal conflict, and also saw Czech soldiers, scholars, and diplomats, range from Scotland to Lithuania to gain support for the Hussite cause. This lecture focuses on the interactions between Bohemia and the British Isles in the fifteenth century, including the transmission of texts and ideas between the two countries, Czech attempts to enlist support for their cause, and the often violent reactions of English rulers who denounced the Hussites as heretics and sought to crush them with military force. Dr Mark Whelan is an historian of late medieval and early modern Germany and Central Europe. He has held fellowships in Berlin, Munich, and Vienna, and teaching posts at Royal Holloway, University of London, and the University of Manchester. He currently works at King's College, London, as the German language and archives expert on the project 'Bees in the Medieval World, c.1200-1600'.